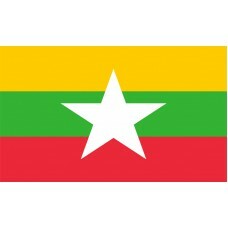 The Myanmar flag features three horizontal bands in the colors of yellow, green, and red. 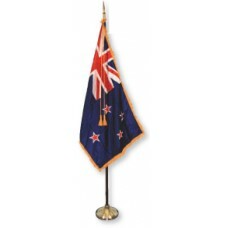 In the middle of the flag, is a 5-pointed white star. 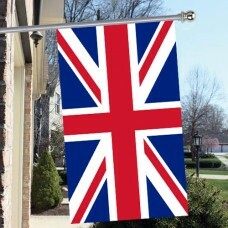 The three colors of the flag represent, "solidarity, peace, tranquility, courage and decisiveness." The Myanmar Flag that is used today was adopted on October 21st, 2010 and replaced the Myanmar flag that had been used since 1974. Myanmar (also referred to as Burma) is the second largest country in Southeast Asia and shares borders with China, Laos, Thailand, Bangladesh, India, Andaman Sea, and the Bay of the Bengal. The capital city of Myanmar is called Naypyidaw and it became the capital in 2006 after the government moved it from Yangon. Yangon is the largest city in Myanmar. The economy in Myanmar is mainly reliant on jade, gems, and oils as well as tourism which is gradually increasing, and Myanmar is proving to be a popular tourist destination. The most popular tourist attraction is "Bagan" (which was formerly known as Pagan). It is an ancient city in Myanmar in the Mandalay area that is home to the largest combination of Buddhist temples, Pagodas, and ruins in the world. The temples and ruins date back to the 11th and 12th centuries. The most well-known, famous, and sacred building is the "Shwedagon" or "Greater Dragon" Pagoda as it is thought that it contains a strand of Buddha’s hair as well as other artifacts and relics. It is a 2500 year old Pagoda that is located in Yangon. The "Buddhist Monastery of Taung Kalat" is another renowned and very visited site. The monastery sits on top of an extinct volcano plug and there are 777 steps leading up to it. Myanmar, in the ancient times was a strong, steady and successful kingdom. During the 18th century, Myanmar became a place of strong interest to European traders and, as a result of 3 Anglo-Burmese wars, on January 1st, 1886, Burma came under full control of Britain. This caused many frequent conflicts and riots until the 1930s, which were mainly caused by the Burmese as they did not approve of the British rule and because of the disrespect that the British had for the Burmese culture. On April 1st, 1937, Burma became a colony of Great Britain and Ba Maw became the first Prime Minister and premier of Burma. Ba Maw was against the British rule and opposed them during WWII. In 1940, the Burma Independence Army was formed in Japan by Aung San (the fifth premier of Burma), before they entered WWII and from 1940-1945, Burma was occupied by the empire of Japan until their defeat. During this war, Japan lost over 150,000 of their men. Following the war, Aung San guaranteed the independence of Myanmar and on January 4th, 1948, Myanmar finally became an independent state. Until the world ends up shattering, long lives Burma!